BURBANK, California, May 20, 2008 – Nothing is impossible in the wacky, wonderful world of Phineas and Ferb: The Fast and the Phineas coming to Disney DVD on July 29 from Walt Disney Studios Home Entertainment. 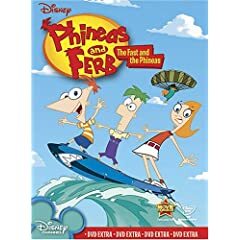 In this hilarious animated series created by Dan Povenmire (“Family Guy”) and Jeff “Swampy” Marsh (“The Simpsons”), you will laugh along with two of Disney Channel’s fastest rising stars, Phineas and Ferb, in some of their most outrageous and inspired animated adventures, that includes an exclusive, never-before-seen two-part bonus episode and awesome new set-top games! Every over-the-top episode is jam-packed with the pair’s trademark crazy schemes, hare-brained ideas and amazing escapades – set to unforgettably goofy original songs. See America’s favorite stepbrothers make the seemingly impossible…totally possible! Phineas and Ferb’s Homemade Tree Shade Arcade (Set-Top Games) –“MOM!!! Phineas and Ferb made a Homemade Tree Shade Arcade!! !” Oh yes they did! What else for two mad cool adventurers to do with a humdrum summer day? With a little elbow grease and a lot of ingenuity, they’ve converted their backyard into an awesome arcade, complete with four custom-designed games, and everyone is invited to join the wacky fun!! And don’t forget to watch out for Perry—he’s undercover! Original Pitch by Dan Povenmire –Go behind the scenes in this unique opportunity to witness the creator of Phineas and Ferb (and voice of Dr. Doofenshmirtz) Dan Povenmire during his original pitch for the show, which (he swears it’s true) is loosely based on his own childhood. Post a funny question about the movie using the community form below. Send us the URL of your question to irwin (at) greatdad (dot) com. Update: This contest is closed. See the winner’s page. Who, in your opinion, is the best celebrity dad and why? Let us know using the comment form below to win a free copy of this movie. In the case of multiple entries, we’ll draw three winners from the best responses on August 16, 2008.